“Think. Speak. 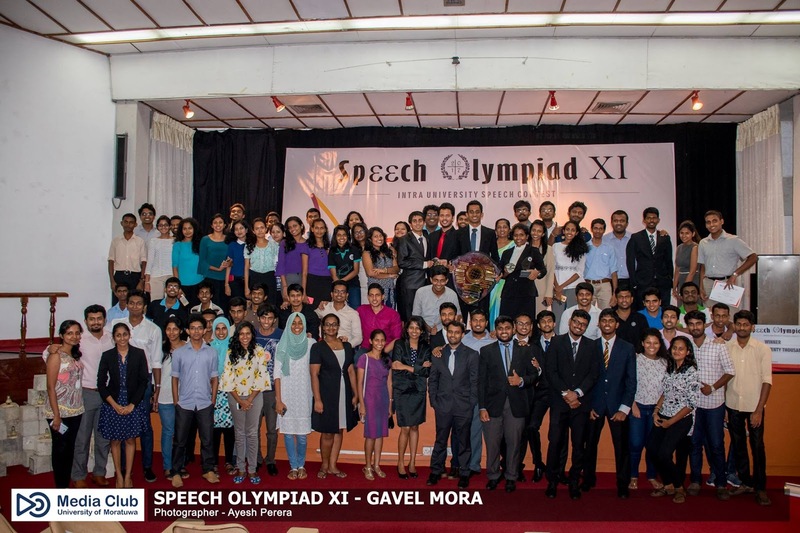 Change” was echoing through the minds of the members of the Gavel Club of University of Moratuwa as they set sail on a voyage to unveil the oratory excellence within the University of Moratuwa with the beginning of the newest chapter of Speech Olympiad, the 11th edition. Speech Olympiad is the flagship event of the Gavel Club of University of Moratuwa, which is an affiliate of Toastmasters International. It is an intra-university speech competition, where all undergraduates in the university from all the faculties battle for the champion trophy and the title of the champion speaker of the University of Moratuwa. The voyage officially began with the preliminaries which were held on the 14th of September 2017. From more than 60 registrants, 12 semifinalists were chosen for the next step. 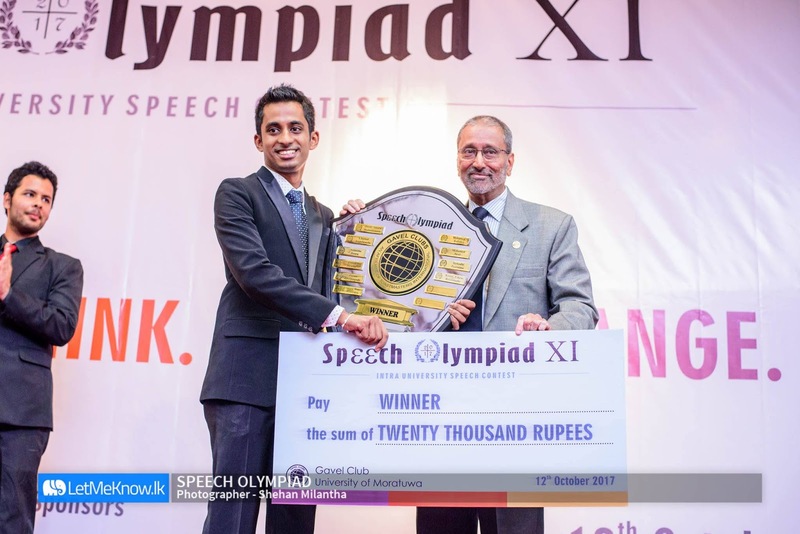 The Semifinals were held on the 23rd of September 2017 where the top 5 speakers were selected to battle at the Grand Finale. The top 5 contestants were Asitha Rathnayaka (Department of Civil Engineering), Kanchana Ranasinghe(Department of Electronic and Telecommunication Engineering), Chinthani Kumaradasa ( Department of Electronic and Telecommunication Engineering), Malindi Jayathunga (Department of Integrated Design) and Dulinda Perera ( ’17 batch, Faculty of Engineering). The two reserve finalists were Gunavaran Brihadiswaran and Nadarasar Bahavan. A series of workshops named, “Dream Big 2017” was held in par with the Speech Olympiad XI to groom the oratory skills of the participants. TM Sandun Fernando, DTM Chathura K. Sooriya-Archchi and Ms. Celina Cramer shared their expert knowledge to provide tips and tricks of public speaking for the undergraduates to ace their speeches. At the preliminaries the contestants had to undergo the challenge of a 5-7 minute prepared speech, while the bar was raised at the semifinals and the finals since in both the contests the contestants were judged based on a 5-7 minutes prepared speech as well as a 1-2 1/2 minute impromptu speech. All the judgements were given by an esteemed panel of judges consisting of eminent Toastmasters. The panel of judges at the Grand Finale was led by DTM Yusuf Jeevunjee. The much-awaited Grand Finale of Speech Olympiad XI was held on the 12th of September 2017 at the Civil Auditorium of University of Moratuwa. It was a packed house as dignitaries, undergraduates, invitees from other universities and well wishes gathered in numbers to cheer the competitors. 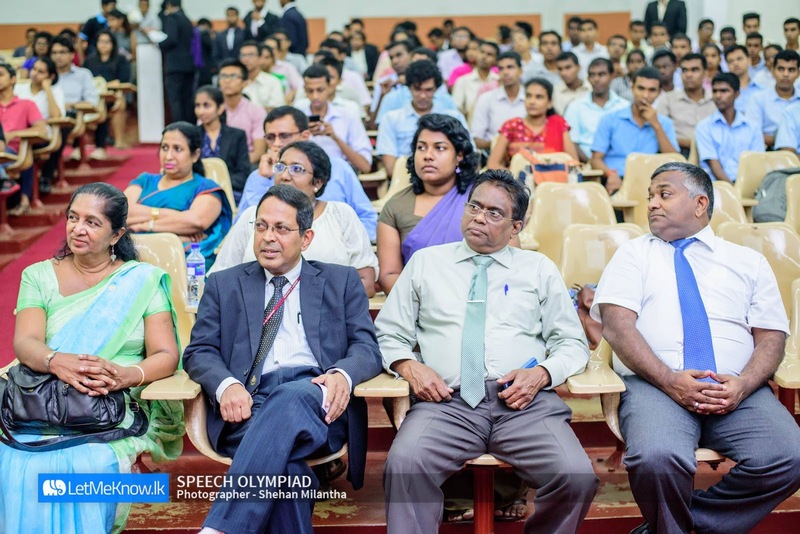 Deputy Vice Chancellor of University of Moratuwa, Prof. R.A. Attalage, graced the event as the Chief Guest while Prof. Lalith De Silva, Dean of the Faculty of Architecture and DTM Srianthie Salgado, Gavel Club Coordinator of Sri Lanka graced the event as Guests of Honour of the evening. Dulinda Perera became the overall champion of the evening and his prepared speech “You’re just a crooked nose” clearly depicted his powerful oratory abilities and left the audience in awe. 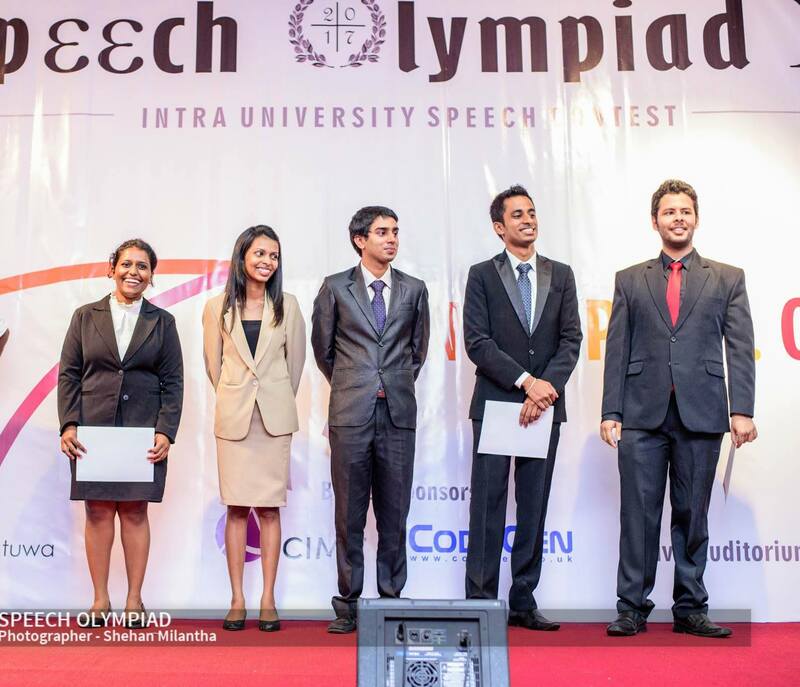 The first runner-up was Malindi Jayathunga and the Asitha Rathnayake emerged as the second runner-up. 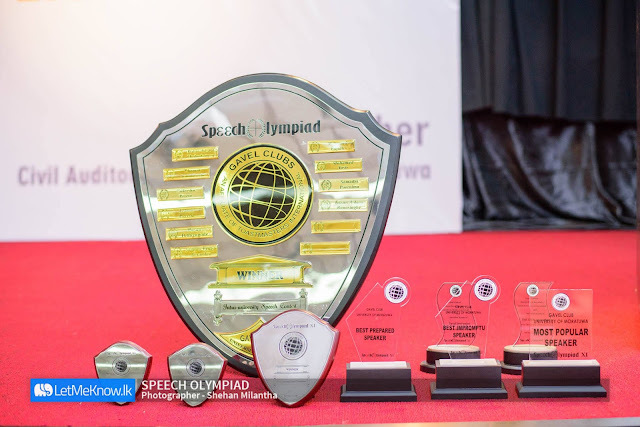 For the first time in the history of Speech Olympiad, there were two additional awards to recognize the best prepared speaker and the best impromptu speaker of the evening. 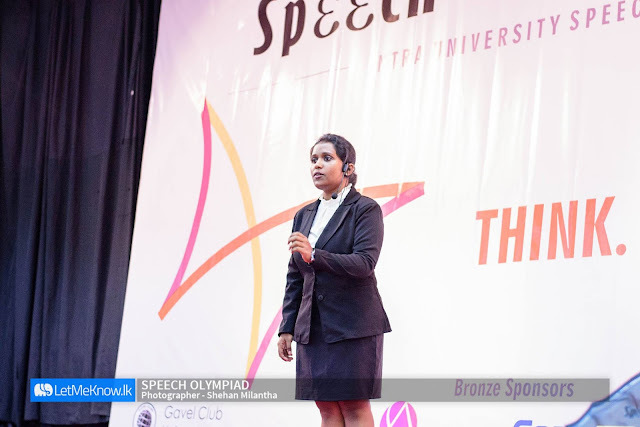 Taking the ownership of yet another title, Malindi Jayathunga was recognized as the “Best Prepared Speaker” while Dulinda Perera won the award for the “Best Impromptu Speaker”. Next it was time to crown the most popular speaker. Taking home three awards Dulinda Perera, the Champion speaker, won the title of the “Most popular speaker” with the highest count of public votes, comprising of both online votes before the contest and audience votes on the day of the contest. Speech Olympiad XI would not have been a success if not for the hard work and dedication of a certain set of individuals. The project was chaired by Praveen Kumarasinghe and Chathuranga Amunugama. President Piyumi Banadaranayake and the two Assistant Project co-chairs Harsha Chamara and Chamode Wijayasekera rendered their fullest support to the project chairs to make the event a success along with the past and present members of the Gavel Club. The unstinted support of the Club Counselor, DTM Zameen M. Saleem, and the Staff Advisor, Dr. Indika Sigera, should also be mentioned with special regard. 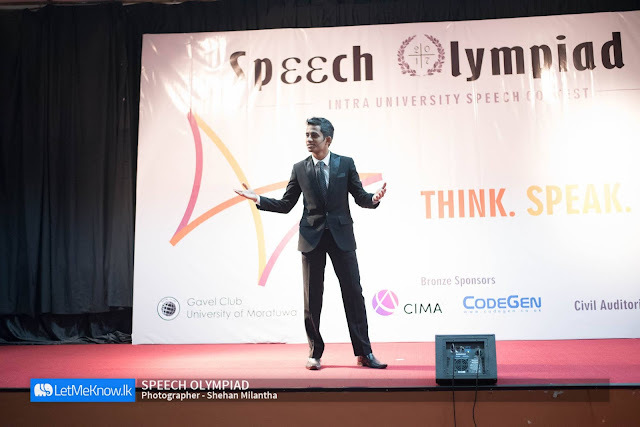 Last but not the least; the Gavel Club of University of Moratuwa would like to extend their sincere gratitude to Codegen International and CIMA for sponsoring the event as the bronze partners and all the well-wishers who provided a helping hand to make this event a success.